*These are the primary dates for the group, some people will come early, leave late or not staying the whole time. Hotel (all inclusive, food, drink and alcohol included) & Dives (~15 dives, 2 morning, 1 afternoon most days and 1 boat night dive) $1,077 double occupancy/person, $1,427 single occupancy/person. Hotel & Dives - Call 011 52 987-872-0700 ext 3466 or ext 3467 (international number) and tell them the group code "Phil19" (Please note, it's critical you give them the group code so we stay together and keep our block). 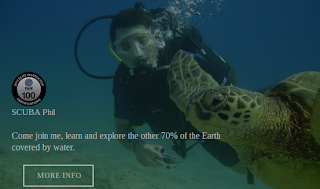 On the call they will confirm with you the dates (5/4-11/2019), single or double occupancy, number of people, number of divers vs non-divers and they will book your hotel, food AND dives. If you want to come early they can book your at $140/single, $90/double occupancy per additional night. Once you get your confirmation number, download this form, fill it out and fax it back along with a photocopy of the credit card (both sides) duly signed and a photocopy of an ID of the card holder as noted on the form to handle the payment (Remember, NEVER put your CC info in an eMail) That will take care of booking your room/food - including WiFi, In-room Safe, and dives, now go book your flights! PLEASE NOTE: We ALL need to have this done and booked by March 1st, 2019, so don't delay. When booking hotel, they will also book the dives ($400 for at least 13 dives). Phil is running a special for the trip: Buy 4 specialty classes @ $170 ea and the 5th one is free (5 needed for Master Scuba Diver) - email Phil to sign up phil@scubaphillv.com. Ideal flight: We know United, Frontier, American and US Airways all fly direct. Note: Also consider flying to Cancun and taking the ferry to Cozumel. Note: This is an overhead environment, it is not recommend if you are not comfortable diving in this type of environment. 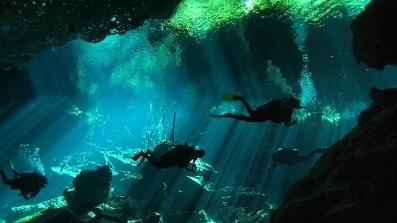 Do two, once in a lifetime dives - Dive the Cenotes in Playa del Carmen (sites and days to be determined). If enough people want to go a few days early we can do the Cenotes before we kick off our week in Coz, OR as some folks have suggested, we could take a low dive day, like Tuesday, take the ferry over and spend the day on the mainland doing two Cenotes. Here is a quick survey to help us plan better. Please take a minute and click this survey and let us know. (This is not a financial commitment, just gauging interest).